April 21, 2012. Boston, MA – Peter Rowan and Tony Rice, along with the Travelin’ McCoury’s came to Boston’s Wilbur Theatre for a night of “The Music of Bill Monroe”. They played 2 sets of just under an hour, including the encore number. All of the tunes were songs written or recorded by Bill Monroe. We were sitting right in front of the stage, so had a good view of everything, although the sound was mostly behind us. Still, you could definitely here the acoustic instruments from where we were sitting. There were only a handful of mikes on stage and the members of the band moved around to get into position to play or sing. It was quite the ballet sometimes. And did I mention that Tony Rice was right in front of me!! Playing the 1935 Martin D-28 (58597) he got from Clarence White!! What a treat! The concert started simply with just Peter Rowan(guitar, vocals) and Ronnie McCoury (mandolin, vocals) singing Long Journey Home before the band strolled on stage to kick it into high gear. Peter Rowan has a great voice and is still going strong from the looks of things. The rest of the band members were: Rob McCoury (banjo), Jason Carter (fiddle), and Jerry McCoury (bass). Jerry was apparently subbing for the regular bass player who had to be back home waiting for a baby delivery. This was some high caliber bluegrass! The next song was “the first bluegrass instrumental ever recorded” with Earl Scruggs on banjo: Bluegrass Breakdown. This gave everyone a chance to blister the strings on a quick one. The band was tight! Of course, they were playing all these bluegrass standards, which they’ve probably played a million times, so even if they never rehearsed before, it’s okay! In fact, Peter noted that ‘we don’t have tuners on our instruments’ and that they also didn’t have a set list (at least one that was written down). He claimed that they never knew what Bill Monroe was going to play or what key it was going to be in – Monroe would just chop a chord and you better get goin’! There were certainly a few tributes to Earl Scruggs, since he contributed mightily to the bluegrass sound, along with Bill Monroe. 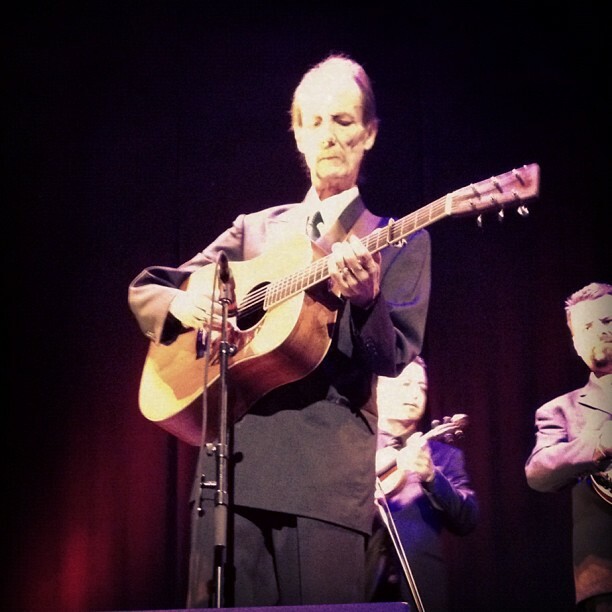 A tune written by Scruggs, Groundspeed, was led by Rob McCoury. Both Ronnie and Jason Carter had amazing solos on this with good support from the band. 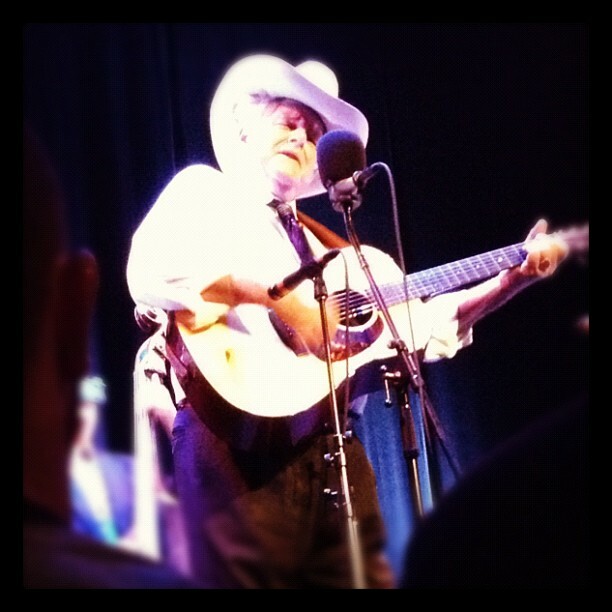 “The most influential guitar player in the history of bluegrass…” came on the stage after that – Tony Rice! I had never seen him play before (that I recall, anyway). I was getting goosebumps just watching him, and the guitar is legendary. Even while he was tuning up, you could hear its power. As Peter said while Tony was tuning on stage, “It doesn’t cost a thing, but I’d pay to hear that.” It took about the first set for Tony to warm up. He does not look in the peak of health, even though he’s only 60 yrs old. A couple of times you could hear him talk on stage from where we were and he sounded like Miles Davis with the croaky voice. I was surprised watching him that he actually flubbed a few notes! Others around me were speculating about arthritis – at times it looked like he was telling his fingers to do something but they were not cooperating the same way as in the past. What people may not notice immediately was that the rhythm playing added another dimension on top of what Peter was playing. There were times when he added these jazzy chords to the progression that caused everyone to smile. Over the course of the night the solos got better and better. In particular, Walls of Time and Kentucky Mandolin, Cheyenne, and Salt Creek, were highlights. It looked like the rest of the band was enjoying listening to Tony, too, almost in reverence. Other highlights included the singing and bass playing of “Uncle Jerry” McCoury. The bass was solid throughout and he has one of those good country voices with a little bit of twang. Jason Carter on fiddle was inspirational in his playing, either as a lead or accompanying. I really enjoyed the song, Beautiful Life, which had a simple guitar accompaniment but the feature was the quartet singing around the microphone. And did I mention the awesome banjo and bass duet on This Land? I guess there wasn’t anything I didn’t like about this concert. The sound could have been better from where we were sitting, that’s my only complaint. I hope they make another visit up to New England soon!